CJ a new job for you! "Ability to work effectively with the media and adept at delivering concise, open and effective messaging" - this blog. @TomW: I second the motion. All those in favour, say "Aye". I highly doubt I'd be viable candidate! But I'm flattered. 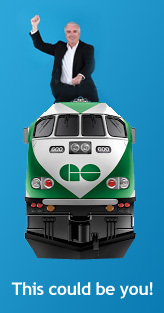 @CJ: That's what Gary thought when he started at GO Transit. Senior management urged him to apply for the position 14 years ago; he did, and the rest is history. Er, sure, but I didn't go to CEO school. What's his background or how do I find out? Oh CJ....that would be so awesome!